While my Quest for Lion Knights’ castle was mostly about re-using old bricks, complemented by the purchase of used bricks (a reality, considering LEGO has discontinued not just many of the parts, but the very color the castle uses), I took a different tact on the Quest for Inter-City train. From the beginning, I decided to try and acquire as much of the train new as possible. 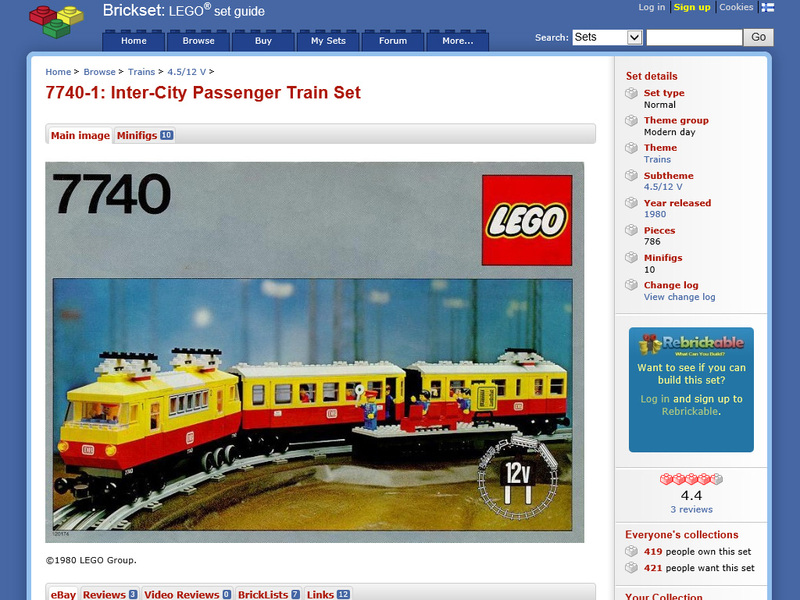 The 7740 Inter-City Passenger Train, released in 1980, came with 786 pieces (approximately, sources vary a little on the number) – and this time, many in colors TLG still manufactures. How much of that is still used in modern LEGO? First, let’s get some preconditions straight. I know you can purchase even some of those old/light grey pieces unused on BrickLink. It is also quite possible there are “new old stock” sets of the 7740 Inter-City Passenger Train or similar sets somewhere. I am not including these in my calculations, because they are not really available or been recently available as new from LEGO itself. This calculation is, then, about what can you, by marching into some regular store or LEGO Pick a Brick today, buy brand new. What is still used or has been recently used by TLG in LEGO sets. Disclaimer: I am not fretting about changes in minute details (such as little different holes in train baseplates or reinforced clips), those are fine, but the wrong color is a no-go. Obviously, the state of the LEGO parts inventory is in a constant state of flux. Sets come and go, old parts are resurrected on whim, the online LEGO Shop Pick a Brick selection changes as whatever they get for its warehouse changes. Some parts may be discontinued, but still available in sets that are sold in stores, or manufacturing may be re-started for them when the need arises. Already since last year, when I made my first Pick a Brick order for this project, a few parts are not available there but others, missing last year, have appeared instead. Still, some things can be approximated quite well. For example, the 1980s 4.5V/12V grey track system was discontinued when the 9V Trains were released in 1991. If that wouldn’t have killed it (it did, though), the introduction of new bluish shades of light and dark greys – the colors used in the tracks and the sleepers – in 2003 would have. We can chalk off 110 pieces from the list with this alone. Then there are the 12V electrics, motors and lights, not used since, 19 pieces. As for the discontinued old/light grey (and old brown), there are 129 additional bricks in the train, we discount those too. This way we have already dismissed 257 pieces. Then there are the windows and doors, many of which come in colors and shapes only used in a few 1980s sets. These are good examples of how randomly the LEGO parts catalog can work, though. After years or even decades of silence, some of these pieces have popped up in things like the 7243 Construction Site (2005) and 7905 Building Crane (2006). I’d say it is pretty safe to dismiss all the smaller windows and doors though, so another 32 parts gone (10 old grey windows were counted earlier). I’d say even the 36 large yellow windows and window panes are mostly gone, but since TLG has still been active around those fairly recently, let’s call them maybe. Train pieces, outside the 12V particulars, have fared a little better. I was able to get the bogie plates from the Pick a Brick and the train baseplates from other sets. These may not always be easy finds, but not impossible either. The train buffer beams have still been used in the 2000s, although with new couplings, but the LEGO Trains RC era in 2006 put an end to those – 18 bricks gone. The 11 non-motor train wheels didn’t make the cut to the 21st century either, nor did the two red 2x6x2 weights lining the locomotive. At this point we’are at 357 pieces that you can’t or probably can’t get as new from TLG or regular stores. This leaves the minifigures, printed parts and sticker sheet, 42 parts when excluding pieces already removed due to color. 5 of these are easy removals, leaving around 37 minifigure parts. Now, these are a little hard to measure, because minifigures are not that easy to acquire new – you are at the mercy of whatever those building stations in stores have available, they may have next nothing useful, but they might also have surprising classic replicas. Roughly speaking, at least 30 of the minifigure pieces should still be available, including the classic head, although they will be harder to acquire than basic parts. The rest, 12 pieces, go into to the maybe, maybe not pile. So, 369 pieces are probably not available as new and not in active use by TLG anymore, although that could of course change in the future. The easy assumption, now, would be that the rest, around 417 pieces, are still available. Not so fast, though. As I’ve learned through my two quests, sometimes even the most innocent looking parts can be traps. This time the big culprit is the train roof. For example, turns out, the yellow 4×12 plate that underlines all the roof elements, is fairly rare. You can find one in a 2010 Technic set, but that’s only one out of six required. The 3×3 slope brick, four required, has been only sporadically used – ever. And last I know, back in 2004. And would you believe: the 3×3 double convex slope in yellow, four pieces, has only ever been used in the 7740 Inter-City Passenger Train. I’d say we must dismiss these 14 yellow parts as well, bringing the total up to 383 non-available or at least very iffy bricks. Out of 786 pieces, you can still get around 403 as new via conventional channels. After 33 years, that’s still 51%. Could be worse. By the way, of the 7864 12 V Transformer set, you can get 20 of the 29 pieces new. 5 Responses to How much of a 1980 LEGO train can you get new?